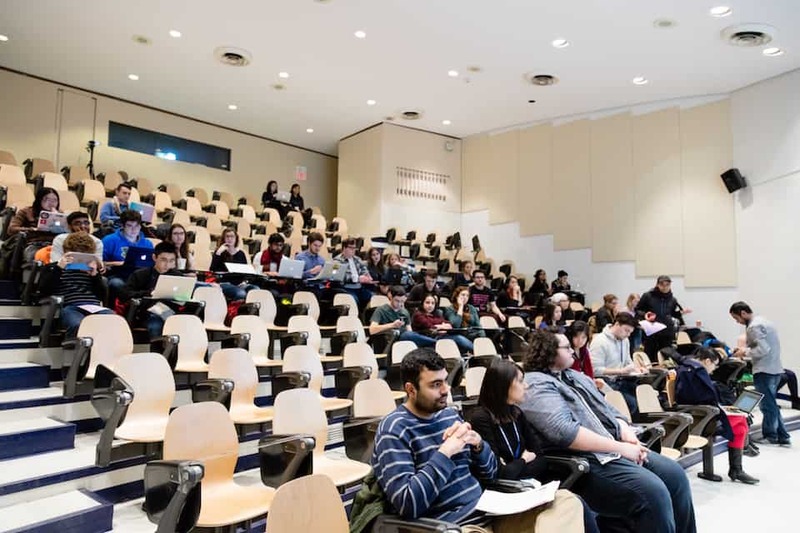 The University of Toronto Students’ Union’s (UTSU) Special General Meeting (SGM) became an informal town hall-style gathering on Januray 28 after the meeting failed to reach its required quorum attendance. In order to be quorate, the January 28 meeting needed at least 150 members in the room carrying a minimum of 350 votes via proxy. With a total of 178 votes at the meeting, the SGM did not proceed. The motions that were on the agenda will be forwarded to the UTSU’s Board of Directors and will be voted on by the board at a later date. UTSU president Ben Coleman blamed the low attendance on poor weather and the fact that “there is no existential crisis,” referring to the efforts to pass a legally compliant board structure at the two previous general meetings. Motions set for the agenda included items on computerized voting, paper ballots, an accessible computer lab, an endorsement and donation to the Black Lives Matter movement, and an expression of solidarity with the Cape Breton University Students’ Union. Some notable discussions surrounded examination of the UTSU’s relationship with the Canadian Federation of Students (CFS) and ethical divestment. The ethical divestment motion moved by second-year University College student Aidan Swirsky calls for opposition to investment of U of T funds in any company profiting from unethical practices regardless of where the company is, or where violations take place. Supporters of the Boycott, Divestment and Sanctions (BDS) movement attended the meeting in support of the motion. Unlike BDS, however, Swirsky’s motion does not specify a specific regional conflict or particular population, electing to target the university’s investments in corporations complicit in human rights violations more broadly. BDS is a movement to end human rights violations in Palestine, targeting companies and governments that contribute to such abuse. In a joint statement to The Varsity, Students Against Israeli Apartheid (SAIA) and the Graduate Students’ Union BDS Committee (U of T Divest) said they have long called on U of T to divest from such companies. They claim the motion supports their campaign calling on the University of Toronto Asset Management Corporation to divest its holdings in Hewlett Packard, Lockheed Martin, and Northrop Grumman for the businesses contributions to Israel’s national defense infrastructure.. According to these two groups, these companies profit from violations of Palestinian rights through Israel’s occupation and apartheid. However, SAIA and U of T Divest still expressed concerns with the motion, saying that the scope of the motion may be too narrow to be effective. First-year Victoria College students Stephanie Spagnuolo and Carleigh Campbell moved a motion to continue the committee struck earlier this year to investigate the relationship between the UTSU and the Canadian Federation of Students (CFS). Their motion would strike the committee each year with the mandate of considering ending the UTSU’s membership with the organization. The CFS is a national student advocacy group comprised of member student unions. It also has various provincial branches. The UTSU has been a member of the CFS since 2002. In 2013, several divisions at U of T held referenda to divert fees from the UTSU to their respective student councils, citing the union’s membership of the CFS among the main reasons for their desire to leave the UTSU. Members were divided on the topic and heated debate followed. Abdulla Omari, a UTSU director representing UTM, commented on the UTSU’s relationship with the CFS. Elaborating on their earlier statements, Spagnuolo and Campbell remarked that the CFS’ governance structure and policies restrict access to democracy. “Students wishing to leave the CFS would need to collect 10,000 signatures on top of our stressful academics and student life, just to express what should be a basic democratic right,” they said. They concluded by suggesting U of T students to try to get involved in their elected student body to hold them accountable where they see fit, and investigate where their fees go. Preparations are underway for the University of Toronto Students’ Union (UTSU) Special General Meeting (SGM) later this month, where several member-submitted motions will be discussed and voted upon. The agenda for the SGM includes a motion regarding the UTSU’s membership with the Canadian Federation of Students (CFS), a motion for “ethical divestment”, a motion to allow clubs and service groups to have a say in the UTSU’s budgeting process, a motion to create an accessible computer lab, and a motion to authorize computerized voting. The SGM marks the UTSU’s third general meeting this academic year. Motions that were not discussed at the UTSU’s Annual General Meeting on October 7 will also be debated at the SGM. Among those items are a motion to ensure paper ballots for UTSU elections, a non-binding motion on free tuition; a motion calling for accountability to UTSU members, a motion on accessibility for professional faculty students, a motion for an endorsement of the Black Lives Matter movement, a motion on prevention of sexual violence, and a motion to stand in solidarity with the Cape Breton University Students’ Union (CBUSU). The CBUSU lost a case against the CFS and was ordered to pay $295,000 in membership fees plus legal charges, resulting in the union filing for bankruptcy. “The Union’s relationship with the CFS should be thoroughly examined, particularly on the question of if this relationship should continue. This is achievable only through passing this motion,” Spagnuolo said. “Students disinterested and disenchanted with the CFS, like myself, would have to collect ten thousand signatures on top of their stressful academics – just to express what should be a basic democratic right,” she said. Spagnuolo said that she also sees a lack of transparency in the CFS’ budget — which has not been made available online — and expressed concerns over the CFS’ lawsuit with the CBUSU. 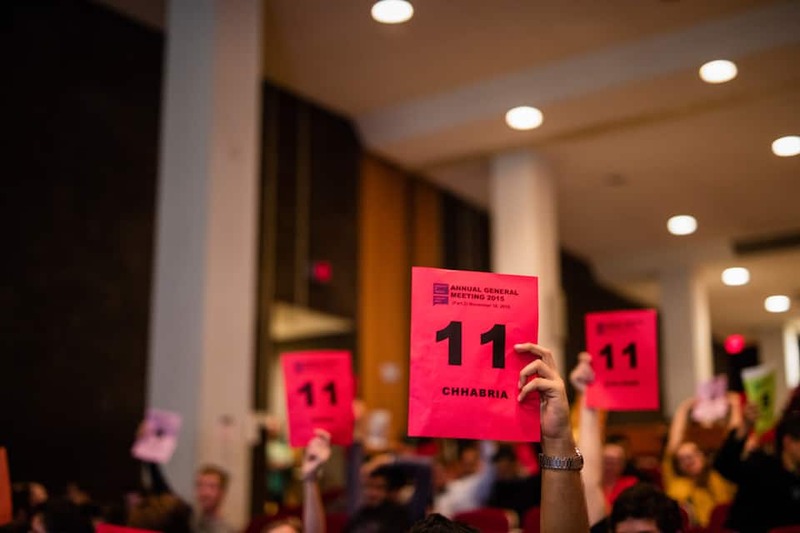 UTSU president Ben Coleman and UTM director Hashim Yussuf both raised concerns with the wording of the motion, questioning its seriousness and suggesting that the motion was a joke. Arte said that she is confident in the CFS’ democratic structure and the bold actions resulting from student unity, naming actions such as this winter’s summit on Racialised and Indigenous Student Experience, and the national Lobby Week, as examples. She added that information on the CFS’ democratic structures and information from the organization’s most recent national meeting is available on the CFS website. Back in June 2015, UTSU vice-president equity Sania Khan outlined in her executive report that there would be an opportunity at an SGM to vote on whether the UTSU should endorse the Boycott, Divestment, and Sanctions (BDS) movement against Israel. The movement calls for the University of Toronto Asset Management Corporation (UTAM) to divest in companies that, according to pro-BDS advocates, contribute to human rights abuses in Palestine. Members of various Jewish student groups expressed concerns with the motion, arguing that the goal of the BDS movement is to eliminate Israel as a Jewish state and that a UTSU endorsement of BDS would create a divisive atmosphere on campus, contributing to the marginalization of Jewish students. The UTSU’s Board of Directors voted down a motion to strike an ad-hoc BDS committee in July. At the time, a BDS motion was still set to appear on the agenda for the SGM. However, a motion on BDS is conspicuously absent. Khan did not respond to a request for comment. Swirsky’s motion calls for the UTSU to lobby UTAM to divest from “any company that is found to profit from human rights violations, labour violations, especially those involving children, sweatshops or undocumented workers, war and weapons manufacturing, and/or the creation of environmental disasters.” This call for divestment would not be limited to companies operating in any one country or location. “I think this motion is necessary because as students who are paying thousands of dollars in tuition to the University, it is our right to exercise some input over the investments being made with our money,” said Swirsky. He cited companies that employ child slavery in the Democratic Republic of the Congo and unsafe working conditions in Bangladesh as examples of unethical divestment and noted the success of the fossil fuel divestment campaign. The SGM is scheduled for January 28 in Room 2118 of Sidney Smith Hall. UTSU members will be able to proxy their vote online between January 18 and January 25. This article has been updated from a previous version to include comments from CFS national chairperson, Bilan Arte.